“Scandal” wrapped its seven-season run on Thursday night with a final episode that packed in fierce outfits, killer monologues and the most tragic death in the history of the series (RIP David Rosen). It also gave us a Shonda Rhimes’ cliffhanger that probably made more than one Gladiator knock over their glass of red wine in shock. And we’re sure if you saw the finale you already know we’re talking about that “YAS QUEEN!”-enducing painting of Olivia Pope (Kerry Washington) two young girls see hanging in the Smithsonian’s National Portrait Gallery. You know, something that suggests she eventually becomes PRESIDENT OF THE UNITED STATES. Following the episode, Rhimes, Washington and the rest of the cast sat down on “Jimmy Kimmel Live!” to discuss the ending, and of course that moment came up. Well, that sounds par for the course for, Rhimes. 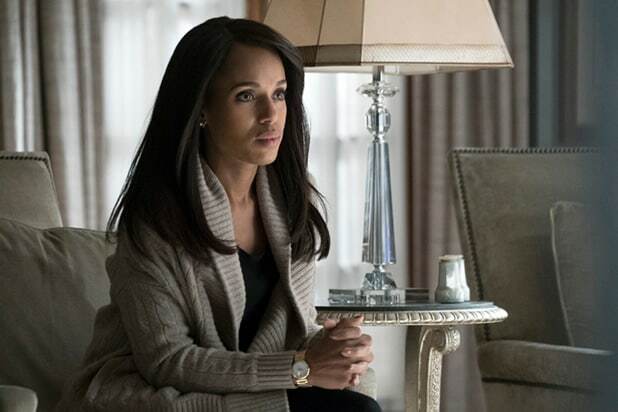 However, that’s OK, because Scott Foley, who plays Liv’s sometimes lover (other times brother) Jake Ballard, told TheWrap in an interview last week that the seventh and final season of “Scandal” would come to a close with an ending he wants you to make your own. And we’re 99.9 percent sure that portrait of Olivia is what he was referencing. “But I think it’s important for the viewer, when that happens, and they see the moment that I’m talking about, to make it personal to them. And I know this is sounding very ethereal, and forgive me for that. But there is an opportunity there for it to have whatever you want it to have,” he added. Watch Rhimes and Washington discuss the ending above and see the portrait below.